Screening patients to understand their social context is the gateway to addressing barriers and improving health. Reprinted with permission from Fam Pract Manag. 2018 May-June;25(3):7-12. Decades ago, the historic Whitehall studies demonstrated the impact that social context can have on individuals’ health and wellbeing. (1,2) Family physicians understand this well because they see firsthand how social needs (or “social determinants of health”) create access, adherence, or performance barriers, often impeding their efforts to provide evidence-based clinical care that improves overall health. (3,4) For example, a patient who lacks safe housing, reliable transportation, or adequate food resources may struggle with medication adherence or getting to visits on time. The ecology of medical care(5) and the current financing system, which tend to focus on health care as opposed to health, may limit physicians’ ability to address social context. Nevertheless, family physicians can take practical steps to address social determinants of health in their practices. 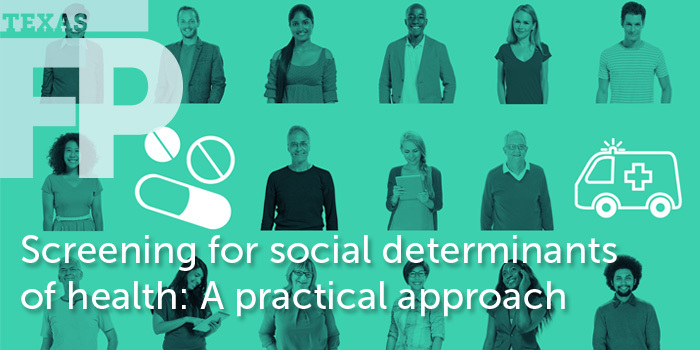 This article will discuss the concerns and challenges related to screening for social determinants of health and offer several tools and recommendations. Despite studies demonstrating the impact of socioeconomic factors on health, there is no evidence-based screening recommendation for social determinants of health from an organization such as the U.S. Preventive Services Task Force. Even without a formal recommendation, several policy statements support such screening,(6,7) and a current national initiative through the Centers for Medicare and Medicaid Services (CMS), the Accountable Health Communities Model,(8) may soon shed evidence on the impact of screening. Additionally, community health centers have been screening for social determinants of health and coordinating related services for years. Their experiences have suggested some best practices for developing “medical neighborhoods,” particularly in underserved and diverse communities. There is no single preferred screening tool recommended for social determinants of health; however, the National Association of Community Health Centers and several other organizations use the Protocol for Responding to and Assessing Patients’ Assets, Risks, and Experiences (PRAPARE). The PRAPARE tool collects demographic information and assesses a patient for a host of social needs including housing, employment, education, security, transportation, social integration, and stress with optional measures of incarceration history, domestic violence, and refugee status (15 core questions and 5 supplemental questions). The data can be directly uploaded into many electronic health records (EHRs) as structured data. It is generally administered by clinical or nonclinical staff at the time of the visit, but a paper version can be given to the patient to self-administer. The American Academy of Family Physicians also offers a social determinants of health screening tool, available in short and long form in English and Spanish, as part of The EveryONE Project. The short form includes 11 questions about housing, food, transportation, utilities, personal safety, and the need for assistance. It can be self-administered or administered by clinical or nonclinical staff. Additionally, CMS’s Accountable Health Communities project developed a 10-question Health-Related Social Needs screening tool (the AHC-HRSN) that addresses housing instability, food insecurity, transportation needs, utility needs, and interpersonal safety. (14) This tool is meant to be self-administered. It draws on evidence from other validated assessments that address specific unmet social and material needs (see “Screening tools for social determinants of health”). Because physicians can become easily overwhelmed and stretched when asked to incorporate “just one more thing” to their daily practice flow, social determinants screening and follow up must not be the sole responsibility of the physician. Instead, it should be a team-based effort integrated into the practice’s care management workflows. Large practices may have care coordinators, patient navigators, health coaches, or community health workers who can assist in streamlining and directing screening processes as well as coordination of care. In small practices, nurses, medical assistants, and other support staff will be critical. In addition to deciding who on the care team will perform the screening, practices also need to decide how often the screening will occur, where the screening data will be stored, how results will be communicated to all care team members, how the patient’s need will be prioritized, and how the follow-up strategy will be documented. For example, a practice may decide that the medical assistant is responsible for administering an annual screening after rooming the patient and entering the results in real-time as social history in the EHR for the physician to review. If a patient is currently experiencing housing instability, food insecurity, and domestic violence, the physician would decide which issue to address first, document the care plan and follow-up plan in the EHR, and instruct the medical assistant to handle the referral details with the patient. Other workflow options would be to use nonclinical staff to conduct the screening either before or after the visit, or have patients complete a self-assessment while they wait. Although having a standardized work-flow is important, that workflow may not always be sufficient; therefore, in screening for social determinants of health, clear communication among all team members is critical. Community of Hope, a community health center in the District of Columbia, has found that when a consistent framework for communication among care team members does not exist, either nothing is accomplished in regard to care management or duplicate and parallel processes occur, creating more work for the team and no change in the patient’s health. The center uses a daily team huddle, appropriate routing of messages, and a process for consistent documentation within EHR notes, telephone encounters, and the problem list to improve communication and care coordination when it comes to addressing the social determinants of health. For any workflow to succeed, practices will need to develop a list of referral resources to connect patients to needed services in the community, such as meal programs or utility assistance programs. 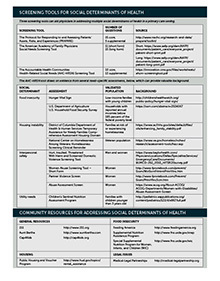 While not comprehensive, the list of “Community resources for addressing social determinants of health” can assist practices in identifying resources. Practices can also develop partnerships with local agencies to address the needs most prevalent in their population and begin to build a medical neighborhood. Physicians can include supplemental ICD-10 “Z” codes in the patient’s diagnosis section and problem list, such as codes Z55–Z65, “Persons with potential health hazards related to socioeconomic and psychosocial circumstances.” Although Z codes are not generally reimbursable, including these codes in the medical record can help with population health, panel management, and quality improvement initiatives. (15) Data collected may also eventually factor into value-based payment systems that will reimburse family physicians for this critical work to improve health. The data can also be useful in developing innovative solutions and partnerships to address the social determinants that most directly affect a population. For example, Community of Hope created partnerships with a mobile farmer’s market as well as a bike-share program to promote healthy eating and exercise not only to the health center patients but also to the community in which the clinic is located. Family physicians have long understood the importance of social factors and their impact on the health of patients and communities. Transforming medical practice to have a larger impact on prevention and health as well as meeting the goals of national initiatives such as Healthy People 2020 will require screening for social determinants of health and development of coordinated care systems that meet social needs. The nation’s community health centers have built a model for screening and care coordination; however, opportunities exist for developing best practices in other settings to improve the health of communities. While this process can be daunting, resources are available. Furthermore, screening and coordinating services to meet social needs is an opportunity to reduce physician and staff burnout related to the inertia of improving health in communities where social and policy barriers prevent us from doing so. This opportunity can also improve the system as a whole, encouraging payment reform that values the factors that most significantly affect health. 1. Marmot MG, Rose G, Shipley M, Hamilton PJ. Employment grade and coronary heart disease in British civil servants. J Epidemiol Community Health. 1978;32(4):244–249. 2. Marmot MG, Smith GD, Stansfeld S, et al. Health inequalities among British civil servants: the Whitehall II study. Lancet. 1991;337(8754):1387–1393. 3. Lasser KE, Hummelstein DU, Woolhandler S. Access to care, health status, and health disparities in the United States and Canada: results of a cross-national population-based survey. Am J Public Health. 2006;96(7):1300–1307. 4. Schoen C, Doty MM. Inequities in access to medical care in five countries: findings from the 2001 Commonwealth Fund International Health Policy Survey. Health Policy. 2004;67(3):309–322. 5. Green LA, Fryer GE, Yawn BP, Lanier D, Dovey SM. The ecology of medical care revisited. N Engl J Med. 2001;344(26):2021–2025. 6. Committee on the Recommended Social and Behavioral Domains and Measures for Electronic Health Records, Board on Population Health and Public Health Practice, Institute of Medicine. Capturing Social and Behavioral Domains and Measures in Electronic Health Records. Washington, DC: National Academy of Medicine; 2014. http://www.nap.edu/catalog/18709/capturing-social-and-behavioral-domains-in-electronic-health-records-phase. Accessed March 8, 2018. 7. Council on Community Pediatrics, American Academy of Pediatrics. Poverty and child health in the United States. Pediatrics. 2016;137(4):e20160339. 8. Alley DE, Asomugha CN, Conway PH, Sanghavi DM. Accountable health communities – addressing social needs through Medicare and Medicaid. N Engl J Med. 2016;374(1):8–11. 9. Newman TB, Kohn MA. Evidence-Based Diagnosis. New York, NY: Cambridge University Press, 2009. 10. Braveman PA, Egerter SA, Woolf SH, Marks JS. When do we know enough to recommend action on the social determinants of health? Am J Prev Med. 2011;40(1):S58–S66. 11. Briss PA, Brownson RC, Fielding JE, Zaza S. Developing and using the Guide to Community Preventive Services: lessons learned about evidence-based public health. Annu Rev Public Health. 2004;25:281–302. 12. Perrin EC. Ethical questions about screening. J Dev Behav Pediatr. 1998;19(5):350–352. 13. Garg A, Boynton-Jarrett R, Dworkin PH. Avoiding the unintended consequences of screening for social determinants of health. JAMA. 2016;316(8):813–814. 14. Billioux A, Verlander K, Anthony S, Alley D. Standardized Screening for Health-Related Social Needs in Clinical Settings: The Accountable Health Communities Screening Tool. Washington, DC: National Academy of Medicine; 2017. https://nam.edu/wp-content/uploads/2017/05/Standardized-Screening-for-Health-Related-Social-Needs-in-Clinical-Settings.pdf. Accessed March 8, 2018. 15. Gottlieb L, Tobey R, Cantor J, Hessler D, Adler NE. Integrating social and medical data to improve population health: opportunities and barriers. Health Aff (Millwood). 2016;35(11):2116–2123.